Half a dozen members of staff from the School & IDEAS Research Institute attended the ScotSoft213 Global Forum and Young Software Engineer of the Year Awards on Thursday 29th August 2013. The Global Forum being held at the Sheraton Grand Hotel and Spa, Edinburgh commenced with a registration and networking sessions at 12:00 in the afternoon. This was followed by a ministerial address and a series of talks and discussions from a number of venture partners and CEO’s focusing on the topics of Funding Growth and the Challenges of Scaling Fast. Following a short break this lead on to a talk by Larry Cable, titled: “Mobile Internet & Cloud Technologies”. This was followed by a fascinating talk by the keynote speaker Dr Vint Cerf which took the audience from the very birth of the Internet right the way through to present day and into the future with a vision of the net reaching out into the solar system and beyond to our closest neighbouring star 4.3 light years away. 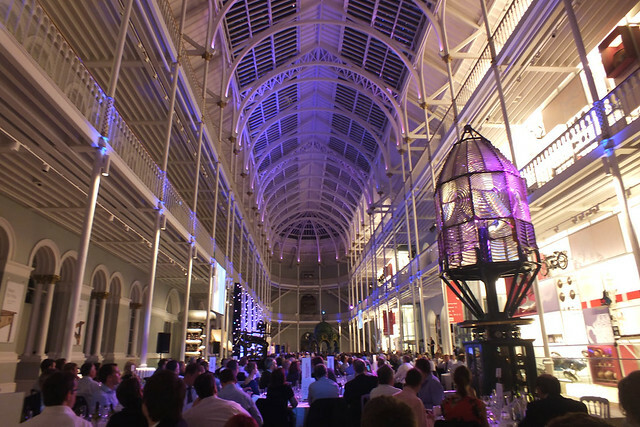 The ScotSoft Awards Dinner was held at the National Museum of Scotland, Edinburgh. This was perhaps 20 minutes of a walk away from the afternoon’s forum venue. This kicked off with a champagne reception at 18:30 for an hour and was followed by some welcoming talks. Dinner was served around 20:00 with a salmon starter and succulent beef as the main course. 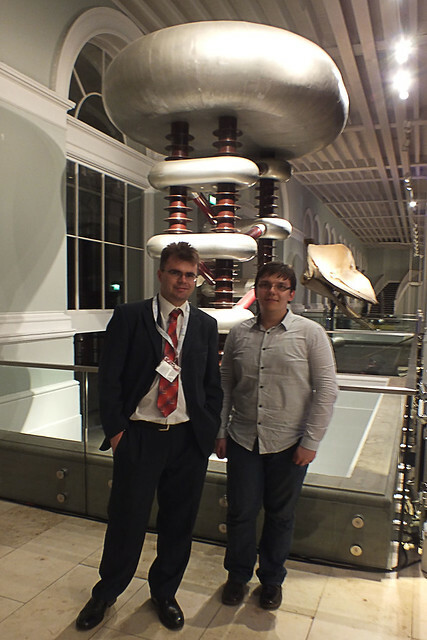 The prizes for the Young Software Engineer of the Year Awards were handed out close to 22:00. Twelve students were nominated from across the Scottish Universities with seven attending the awards ceremony of which four received prizes. Supervised by Dr. Daniel C. Doolan, one of our recent Computer Science graduates Alexandru Ghitescu-Hrin whom recently took up a full-time position at Imagination Technologies was awarded second place for his honours project titled “Procedural Shader Driven Rendering on Modern Hardware” (more info). 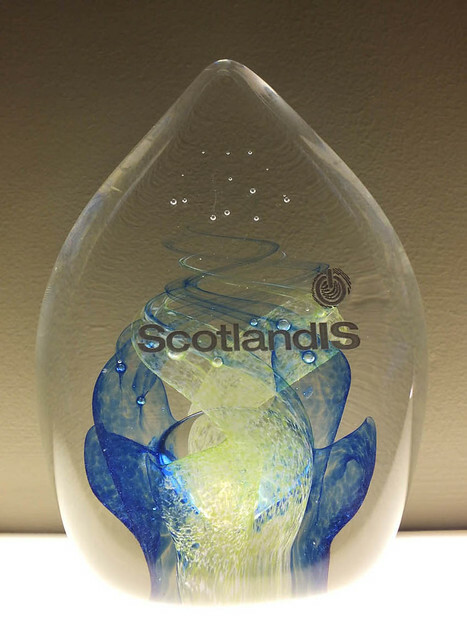 The prize consisted of a certificate, a glass trophy from ScotlandIS and a cheque for the sum of £2000.00 The first place position was awarded to the University of Glasgow for a project on “Mobile Moodle”. This is the second year in a row now that we have had students being awarded a prize. Last year Alin Rohnean under the supervision of Prof. John McCall was awarded the first place prize his honours project “Data Modelling and Prediction Tools for Prostate Cancer” (more info). The after dinner speaker, Comedian Susan Calman then came on stage to entertain the audience until about 23:00. The night of course was still young with the opportunity for networking to carrying into the early hours of the following morning, with the even finally concluding at 01:00. All in all it was quite a long but very enjoyable day. The National Museum of Scotland is well worth a visit if you have never been. In total well over 600 people were in attendance at the awards dinner, consisting of twelve people to each of 52 tables. The above criteria may be something you wish to think about whilst working on your own Honours Projects. The following video is just one example showing the capabilities of the rendering engine that Alex developed (more videos may be seen on the School YouTube Channel).